Sorry this is so gruesome but, really, who hasn't had this thought before? 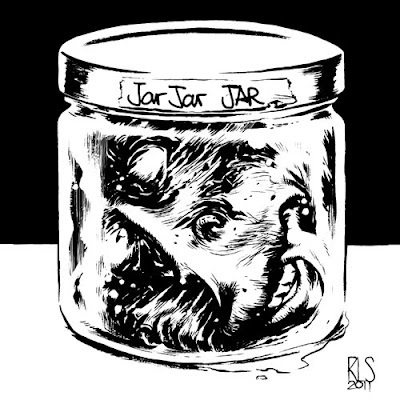 I know Steve already did the Jar Jar joke but what the hell. HA HA!! Dude, SOOO creepy and awesome!! Good God, Ron - this is horrible. Like, John Totleben horrible. Dan, that's quite the compliment! I'm tempted to add this to my etsy store to see if anyone would buy it. And WHO would buy it. So damn creepy. How the hell did you DO that? Wow. Awesome.